“Buy it,” is the easy and obvious answer, but I’m hoping for more than that. I’m hoping you will allow it to motivate you to be more involved in foreign missions, either by direct participation, financial support, or prayer. And I hope that you’ll give it to a young person (or more than one) for those same purposes. I believe the book—just released today—will thrill and entertain everyone who reads it, at least, but I am praying especially that God will use the book to make missionaries out of teenagers. I can also tell you positive stories that will knock your socks off. I can tell you about kids who love their Lord more than popularity. Teens who read their Bible every day and put most grownups to shame in the devotion department. I can tell you about the piety and spiritual fervency of today’s American Christian youth. The sad thing is that a lot of the others are simply living down to the expectations set for them. When parents, pastors, and youth leaders are content with mostly well-behaved teens who make it through high school without getting pregnant or high, that’s the bar they’ll strive for. I hope you’ll expect more from them. When parents, pastors, and youth leaders are content with mostly well-behaved teens who make it through high school without getting pregnant or high, that’s the bar they’ll strive for. I hope you’ll expect more from them. My expectations for teens changed when I spent a week in an immersive tribal-missions experience. I took a group of high-school students through the Wayumi Expedition program at Ethnos360 in Jersey Shore, Pennsylvania. For a whole week we were put through our tribal missions paces, and I watched teens demonstrate a capacity for language acquisition that would rival any seminary student. I watched them navigate the barriers of culture and custom as they adapted to new situations with ease. 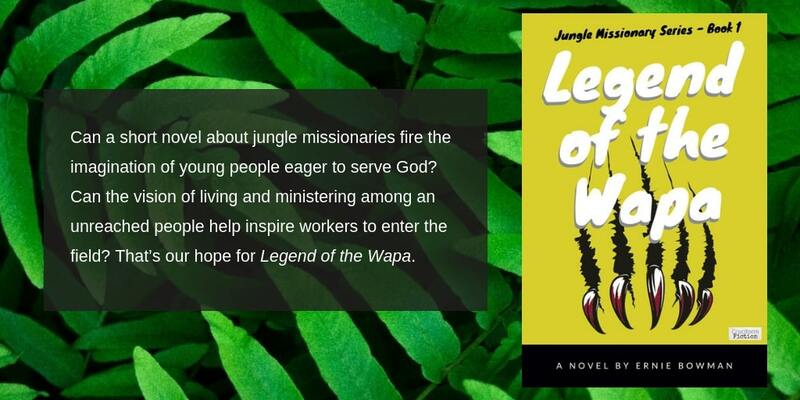 I listened as they talked of a desire to serve God and I saw recognition dawn as they realized that tribal missionaries aren’t supermen or myths. Tribal missionaries are ordinary people being used by an extraordinary God to accomplish great things for his kingdom. But maybe what was most astonishing was that we learned tribal missionaries are, by and large, young people! In Legend of the Wapa, you’ll meet Ian and Rachael Allen. He is the leader of a tribal missionary team at work in the Venezuelan jungle. Ian and his team aim to pierce the heart of darkness and reach the previously unreached Kilo people with the light of the gospel of Jesus Christ. No one was writing fiction about tribal missions. So I sat down to write one myself and Ian Allen was born. I came home from that week of training and I started to look around for a book or a novel or something I could put into the hands of kids and teens and say: “Here – read this! You would be great at this!” There was nothing. No one was writing fiction about tribal missions. So I sat down to write one myself and Ian Allen was born. However, I can also tell you from long experience that if you tell a teenager about a great book you read and then tell them to read it, there is a zero percent chance they will go out and buy it for themselves. They’ll be polite and they’ll listen and they’ll nod along as you talk, but they will end up the same way they began the conversation: bookless. I have found far greater success when I tell a teen about a book and then hand it to them and say: “Here, I bought this for you.” You will be surprised how often they will not only read the book when you do that, but take it seriously too! What I hope you’ll do with my book is I hope you’ll buy two copies: one for yourself and one for a teenager or other young person. I want the adventures of Ian Allen and his team to be a mobilizing force for gospel missions. You may never go and fill Ian’s fictional shoes yourself, but what if there’s a kid who will only need a gentle push from you to get started? What if that gentle push could come in the form of a novel? Plenty of boys wanted to be detectives after reading The Hardy Boys books and innumerable lawyers were born from the pages of a John Grisham legal thriller. Why can’t we do the same with missionaries? That’s the goal, but I can’t do it on my own because I only know so many kids and teens. What I’m hoping you do with my book is buy it, read it, and buy a second one to give away. Be more than a reader—be a mobilizer for missions, and let’s make some missionaries together! I am now in my 50’s but remember well the impact books like Vanya, Peace Child and others had on me as a Jr. High new believer. These and other books like them inspired me to live whatever life God would provide in my future for His glory, whatever the cost. I currently am a group leader for 7th grade boys, and am looking for similar stories to inspire these totally AMAZING young men!! Chris, that’s great – good for you! As the author of the series, nothing could make me happier than to have people (young and not so young alike) grow up with missions on the brain because of Ian and his adventures in the jungle. We all need that in our lives and a story is a fun and entertaining way to get it!